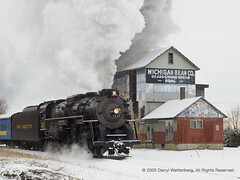 I went out shooting the Pere Marquette 1225 on the North Pole Express runs yesterday morning. Though we had the snow I so badly wanted, the sun didn't make its appearance till late in the afternoon. This is the scene I've wanted, but I'm still looking for that bright blue sky. Nice to see some more amazing shots of 1225 from your eye.